With all the cooking I do, I feel like my arms are constantly submerged in a sink full of bubbles or emptying my dishwasher. In the mornings, trying to get two girls out the door, I often find myself eating breakfast on the go and one of my favorite meals is oatmeal! Driving with a bowl isn’t recommended and many an evening I have taken a crusted bowl out of my car and labored to scrub off the remaining oats off the sides working up a sweat. I have the perfect solution. With a glass of milk, these oatmeal treats, boasting 6 grams of protein and 3 grams of fiber per cookie, are as hearty as bowlful and as healthy too! Grab two on your way out the door for delicious, healthy morning breakfast! 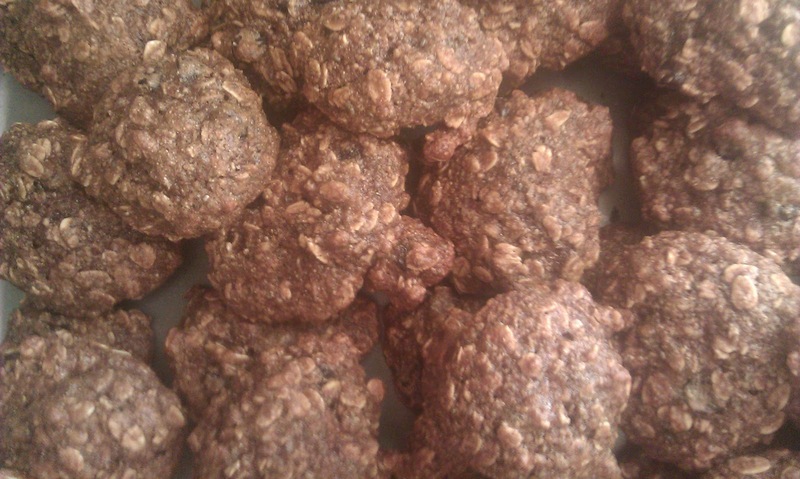 Mix Oats, flour, flaxseed, cinnamon, baking soda, chia seeds, hemp protein powder, and sea salt in a large bowl. Combine Agave, egg white, almond butter, vanilla, and sweet potato puree in a medium bowl. Combine the two mixtures. Spoon mixture into 16 or so evenly spaced cookies and flatten slightly with your spoon. Bake 8 – 10 minutes or until golden brown.